She Paid $3 For This Bowl At Garage Sale...And Sold It For a Whopping $2.2million In A Sotheby's Auction! A New York family received an unexpected windfall when a ceramic bowl they bought for $3 at a yard sale sold for $2.2 million in a Sotheby's auction. The bowl had been on the family's mantel for several years before they decided to get it evaluated. The appraisal determined that it was a nearly 1,000-year-old Ding bowl, an example of the pottery of the Northern Song dynasty, which ruled China from 960 to 1127. The bowl is so rare, in fact, that only one other bowl of the same size, form and identical decoration is known to exist and is housed at the British Museum in London. A collection of Chinese antiques bought by a farmer for as little £100 per item for is expected to make his family a £20million fortune when it sells at auction. Roger Pilkington of Aldbourne, Wiltshire, collected 100 pieces of exquisite Chinese ceramics in the late 1950s and early 60s. The late Mr Pilkington bought Chinese ceramics from the Tang, Song, Ming and Qing dynasties of China, which spanned from 618 to 1912 - paying sums of £100 (£3,000 today) right up to £5,000 (£140,000 today) for higher end items. But the value of Asian antiques has shot up in recent years as the Chinese set about buying back their heritage which was taken out of the Far East by westerners in the 19th century, and Mr Pilkington's family are set to reap the rewards. When he died in 1969 aged just 40, his 'time capsule' collection remained in his family but is now set to be sold by them at auctioneers Sotheby's. Leading the sale is a 15th century Chenghua Blue and White 'Palace Bowl' that was made for an Emperor in the Ming dynasty and is estimated to sell for up to £6million alone. The bowl is so rare that many of the world's greatest collections in museum lack an example. This particular bowl is unique because it is decorated with a larger number of melons than is usual, according to the auctioneers. Another key item is a 15th century Blue and White Ritual Holy Water Vessel from the Yongle period valued at up to £4 million, which would have been used during ceremonial occasions. There are only two companion pieces in the world, one housed in the Palace Museum, Beijing. Other highlights of the collection include another 15th century Yongle piece - a Blue and White Moonflask, valued at £3 million and an 'exceptional and rare' Incised White-Glazed Vase at £80,000. The spherical moonflask was inspired by Middle Eastern models, both in shape and decoration, and is reflective of the then great trade links between China and the Middle East. Nicolas Chow, deputy chairman of Sotheby's Asia, said: 'The Pilkington Collection contains extraordinarily rare items, of a kind seldom seen together on the market. 'This time capsule captures a seminal moment in the history of collecting when connoisseurship in the field reached new heights of sophistication, and when collectors' appetites for the very best were serviced by a handful of brilliant dealers. 'The sale is a rare opportunity for today's collectors to discover exquisite treasures assembled by one of the most discerning and exacting eyes in the history of collecting Chinese ceramics. Mr Pilkington, who was educated at Eton and was part of a family who owned a well-known glass-making firm, is described as one of the 'most eminent and active' collectors of his time. After working for the company in Lancashire glassmaker he moved with his wife, Maureen, to Ford Farm in Aldbourne, Wilts, where he farmed. His primary interests were field sports - shooting and fishing - and racing. The Pilkington Collection auction will be held in Hong Kong on April 6. The best place to find Chinese antiques isn’t China. It’s the U.S. In the world-wide hunt to discover overlooked art trophies to resell to collectors of Asian art, dealers and auctioneers say the first spot they’re eyeing is the American mantelpiece. Carried here by centuries of missionaries, wealthy collectors, importers and immigrants, Chinese artifacts have settled and resurfaced throughout the U.S. in huge numbers compared with the scant amount that remain in China following Mao Zedong’s relic-smashing Cultural Revolution of 1966-1976. Now, in a topsy-turvy twist on the global art market, dealers say they’re locating museum-quality Chinese artworks sitting, sometimes little-noticed, in farms in Vermont, shotgun houses in New Orleans and ranches in Montana and Colorado. With China’s domestic marketplace bedeviled by fakes, Asian clients have come to trust the authenticity of pieces being sold by U.S. collectors, according to David Yu, director of international business development for Beijing-based auction house China Guardian. What’s more, Mr. Yu said mainland buyers often pay a premium for U.S.-sourced work.Starting March 15, the art market’s latest scouring will get tested during New York’s weeklong round of major Asian art sales. U.S. sellers are supplying 80% of Christie’s offerings of neolithic Chinese bronzes, jade figurines, hardwood furniture and porcelain vases. Sotheby’s said the majority of its March auction offerings were also consigned stateside. Scholarship plays a role. During the second-half of the 20th century when academic study of art was largely forbidden in China, Mr. Yu said a generation of professors and amateur scholars in the U.S. took up the charge and now boast some of the category’s most in-depth catalogs and studies on Chinese art. Baltimore’s International Chinese Snuff Bottle Society, a group of private collectors, remains the “best in the world,” he said. And the world’s top private collection of Chinese hardwood furniture, or “huanghuali,” is in Boston as part of the collection of Edward C. Johnson II, founder of Fidelity Investments. Mr. Yu said U.S. scholars have even coined terms to describe Chinese art, like huanghuali, that weren’t indigenous to Chinese culture but are now used by collectors everywhere. As a result, Mr. Yu said his team knows they have a greater chance of bumping into “systematic and better maintained” collections in the U.S. than anywhere else in the world, he added. More and more Chinese art collectors have flown to Japan in pursuit of Chinese antiques, according to a report by China Daily. One of the major reasons is the rising auction prices in China. To bring back lost Chinese relics and art, collectors are flying to Japan. It's a win-win situation, as the move also reinvigorates the Japanese market, said the Xi'an Evening News. In October alone, two important Chinese pieces were bought at the Japan Art Dealers Enterprise's autumn auction. "Four Seasons Landscape," a work by Chinese master Qi Baishi, was sold to a Chinese collector for 70 million yen ($569,615). A painting by Wu Changshuo called "Green and Red Plum Blossom," on the other hand, was sold to a Chinese buyer for 12 million yen ($97,648). Meanwhile, "Building Built in Map," a work dated from the Song and Yuan Dynasties, was sold during the Kansai Art Auction's autumn event to Chinese billionaire Liu Yiqian for 99.93 million yen ($813,166). Since October, Chinese art buyers have flocked to Japan and, as a result, has powered the antique industry in the country. Tour groups were organized by art lovers to travel to Japan as well. To help these art lovers, a noted auction house in Japan has even set up service agencies to help Chinese consumers. According to experts, Chinese artworks started to enter Japan over 2,000 years ago. Statistics also show that 30 percent of Chinese relics being sold on the world market are from Japan. Some of these relics were part of cultural exchanges and national gifts between China and Japan. "Both art and antiques are great investments for people who have money they want to put aside long-term," said Kevin Yardumian, a collector of 19th century art and partner with accounting and business advisory firm Gumbiner Savett. A person with a $500,000 investment portfolio might consider putting 10 percent to 20 percent into illiquid assets, according to Moses. But art and antiques should be only part of that 20 percent, he noted. The art indexes track the prices of individual works sold at auction more than once, for a true "apples-to-apples" comparison over time. 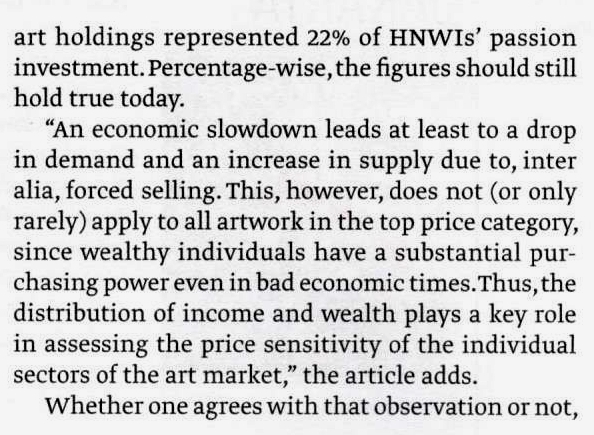 The indexes show that art values rise at about the same rate as stocks. "The returns of our World All Art Index over the last 60 years are slightly below the returns of the S&P 500," Moses said. 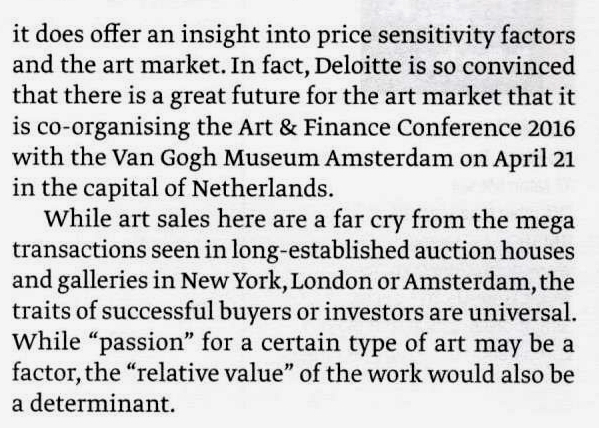 And buying and selling artwork or antiques can entail commissions and markups that can range from 10 percent to 25 percent of the work's sales price, Yardumian said. All these expenses chew into returns. A stamp originally worth just one penny has sold for £495,000 pounds ($707,000) to a private buyer in the United Kingdom. The "Plate 77 Penny Red" sold is only one five in the world according to Stanley Gibbons Investment, who conducted the sale. "This is one of the most desirable and iconic of British stamps for collectors worldwide, highly sought after for more than 100 years," said Keith Heddle Managing Director of Investments at Stanley Gibbons in a press release. Heddle said Plate 77 Penny Reds are viewed as the "Holy Grail" of stamp collecting due to limited availability for buyers. "A tiny handful made their way into circulation, despite the original printing plate being destroyed," he said. The recently sold stamp was purchased for a private collection, known as "The Waterbird Portfolio". In a statement Thursday, the anonymous British buyer claimed the deal was a solid investment. "I am so pleased I bought this stamp, it has given me a buzz I really didn't expect. "I am sure it will prove to be a fabulous investment and in an uncertain financial world, will prove its worth," the statement read. The world's most expensive stamp is the British Guiana One-Cent Black on Magenta, which was sold in 2014, in New York, for $9.48 million dollars. Heddle claims the market for rare stamps has remained resilient amid global market volatility. "175 years on from the introduction of the Penny Black, the world's first stamp, the role of stamps may have changed somewhat, but they can still pack a punch when it comes to wealth preservation," he said. The GB250 Stamp Index, compiled from the Stanley Gibbons' official annually published catalogues, is available to analysts on Bloomberg terminals (STGIGB25). In the ten years to June 2015, Stanley Gibbons claims the combined value of stamps included on the index rose £8,645,250 pounds ($12.3 million). The firm claims annualized return for the index is listed as 10.25 percent, comparing favorably to the S&P500 which comes in just under 8 percent. The best individual performer on the index over the last decade is a U.K. stamp dating back to 1841 known as the 'SG7 1d plate11'. An unimaginative name perhaps, but from 2005 until 2015 the stamp's value is estimated to have risen more than 1500 percent and is tipped to fetch around $17,000 dollars at auction.